I recently learned that I had won first place in the “Patterns & Textures” category of the Virginia Wildlife magazine’s annual Photo Contest. Of course this image does have a lot of texture – as well as contrasts in color – which is why I entered it. But I think it represents the lost art of the intimate landscape. An “intimate landscape” refers to extracting a small composition from the larger overall scene. It’s easy to get caught up in the beauty of a location, and attempts to capture it often involve trying to cram as much of it into the frame as possible. Often, however, this approach does not translate well for viewers. Rather than communicating the grandeur of the place, what comes through is a lack of intent or cohesiveness in the composition. In many instances it is more effective to isolate a subject or focus on an intimate or unique feature. Look for reflections, even ones that are not mirror-like, for abstract shapes and patterns. And don’t restrict your search for colorful foliage to trees, look down as well. It’s a refreshing reminder that beauty is not only found from soaring summits, but can be literally right at your feet. 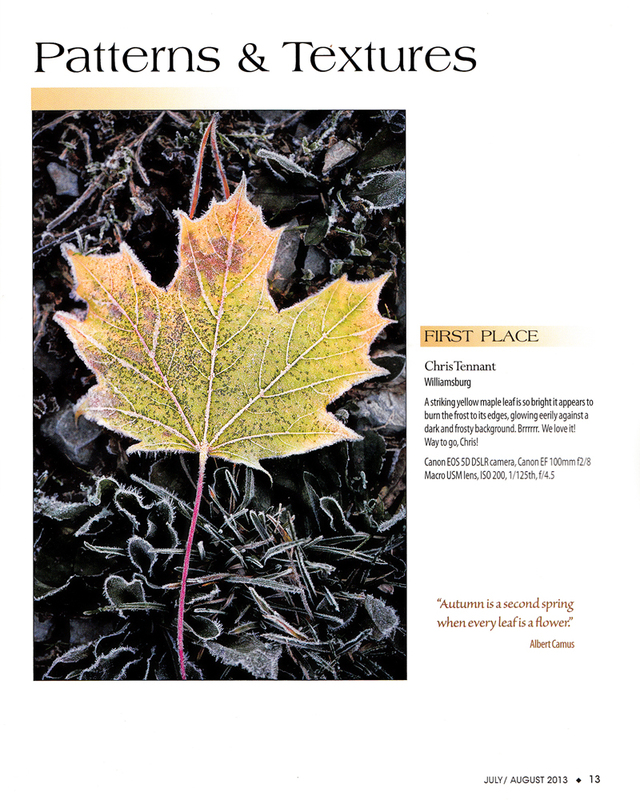 My image of a frost covered leaf won first place in the “Patterns & Textures” category.